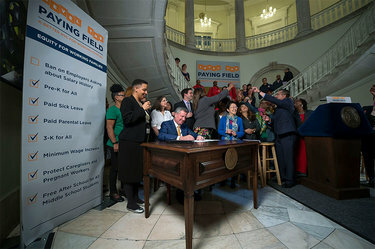 In a milestone achievement in the fight for equal pay, Mayor Bill DeBlasio signed a bill in May of 2017 that prohibits employers from asking about a prospective employee’s salary history. At a high level, the bill states that relying on salary history to determine an employee’s wage perpetuates the gender wage gap. More and more states have adopted similar bans in recent times. We are hugely in favor of this legislation as a necessary step in the long struggle for equal pay, but as of October 2017 when this legislation went into effect, companies are now required to adjust their approach to closing hires and push hiring managers to take a stronger, data-backed approach to offers. The danger of legislation like this, which puts the onus on companies to appropriately value workers, is that it assumes employers have deep knowledge of market rates for the myriad of roles they’re recruiting for. This, of course, is far from the truth. VC-backed companies are at a slight advantage here, as they can typically obtain salary ranges for specific roles based on their investors’ exposure to companies hiring for similar positions. If information on market rates is not readily accessible, most companies take their lead from candidates’ self-reported numbers, which ultimately leaves them with an inflated version of what the market commands and gives them very little hard data to go on. And when you take into account statistics showing that over 50% of job candidates – especially female candidates – don’t know how to negotiate, and aren’t educated on market rates themselves, this puts companies on shaky ground when it comes to extending competitive offers. So what’s the best way to arm your company with the information it needs to thrive in today’s competitive marketplace? Below are six things you can do to stay on top of your hiring game and help build a modern and inspired workforce. Clearly define open roles. The desire for strong, utility-player skill sets in the startup world has resulted in a natural fuzziness around job descriptions, which often makes it harder to find comparable market salaries. It’s good practice to define roles as clearly as possible so you can benchmark against comparable positions in the market and align your salary ranges accordingly. Get deep into market rates. I would argue that this has always been your responsibility as an employer, but a reminder certainly can’t hurt. Rather than relying on candidates’ self-reported numbers, utilize trusted resources that can better inform your internal benchmarks. Radford is the gold standard in third-party salary surveys across thousands of jobs at tech and life sciences companies, and Comparably is a startup committed to bringing transparency to the compensation market. Know how to frame the conversation. Smart hiring managers are able to extract salary data out of candidates without actually asking the forbidden question. As a starting point, the question must switch from the backward-facing, “What are you currently making?” to the more aspirational, “What salary range are you expecting for this role?” In the majority of cases, this line of questioning leads candidates to be open about their expectations, which you can then use as a point of comparison against your data-backed salary ranges. Track your own data. The path to finding the perfect fit for an open role often means speaking with many candidates. Each person will progress differently through your hiring process, but if the opportunity presents itself naturally, it’s good practice to ask for salary expectations as early as possible to help inform the candidate’s fit for the role early on. Asking the question will also help you grow your own pool of self-reported salary data, which you can track easily in your ATS. Focus on the total package. As a company, you should never be completely fixated on salary alone. This is especially critical for budget-constrained startups that tend to offer salaries 15-30% below market depending on their stage of business. A competitive offer goes beyond salary itself, and may include unlimited vacation time, equity, gym membership, and comprehensive healthcare coverage. Bear in mind, however, that candidates will need to feel like they’re receiving at least the minimum amount of money they need to cover their monthly expenses. Financially constrained employees are unlikely to produce consistently good work or remain satisfied for long. The city’s ban is now forcing companies to own real market data themselves, and to approach the negotiating table in a more objective, open, and honest way. While it will take some time to adjust to this new way of thinking, it’s one that will certainly pay off in the long run – not only in terms of closing the gender wage gap, but also in terms of candidates gaining more confidence in the process and being assured that their offer is fair and in line with realistic market valuations.